This year, the run up to Christmas has seen over 100 local artists come together as part of ‘Pop-Up Bristol’ - a new initiative from Made in Bristol that has showcased a diverse range of independent galleries and creative talent on the high street for the first time, adding a new dimension to Christmas shopping at Cabot Circus this year. 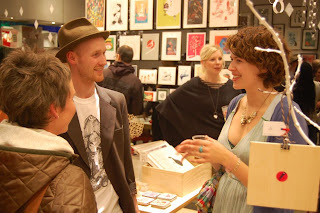 The pop-ups offer the opportunity to purchase quality gifts and one-off pieces by up-and-coming artists. Drawn in Bristol is a newly formed, locally focused illustration collective which hosts regular events & shows in the city. The collective has 50 members and celebrates the work of Bristol based illustrators by providing them with a platform to showcase their work. Their stunning shop can be found in Quakers Friars and features original illustrations, prints and cards, handmade toys and locally designed T-shirts. ‘Upfest’, established in 2008 and now Europe’s largest graffiti art festival, adds a new dimension to Level 1 of the Glass Walk in Cabot Circus with an urban art and graffiti gallery, ‘POP-UPfest’. As well as urban style artworks, the gallery will feature Bristol street art photography and weekly live drawing events. Along with these, the ‘Smithson Gallery’ pop-up provides a platform for a variety of talented artists and styles, offering original art and prints alongside great cards and original gift ideas including bags, cushions, tea towels, ceramics and decoration. Pop-Up Bristol will be hosting a party to celebrate the one-month countdown to Christmas on Thursday November 24th at 6pm across their three temporary festive galleries at Cabot Circus! The event will offer guests a fantastic opportunity to see and purchase all the brilliant artworks the shops have on offer and will also feature live drawing and music. There will also be a chance to meet all of the diverse and talented artists involved in the project along with some exciting special guests. For more information check it out here!